Burnishing is a term used to describe “polishing by rubbing”. This is why if a piece of jewelry with a brushed or matte finish is worn often, it will lose that finish and become shiny. I love the transition a brand new piece of jewelry makes as it becomes your own. I use a matte finish on completed work to emphazise that evolution. Oxidization is a surface finish that can be placed on silver to give it a very dark grey/black color. It is not a plating but a surface patina so it will come off relatively quickly, but only in raised areas in contact with skin and outside objects (pictured below). 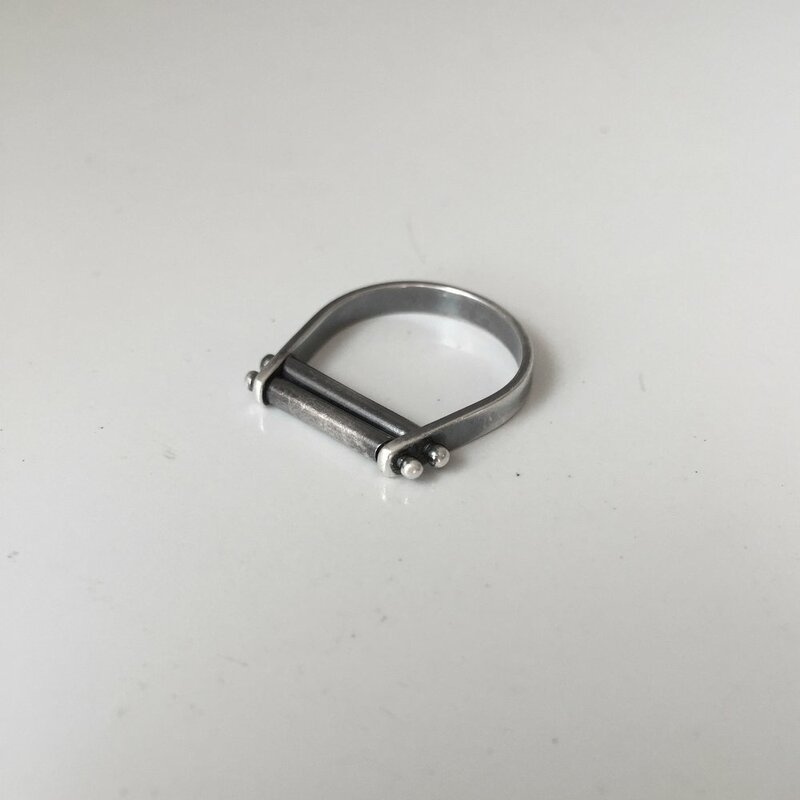 For example, a ring that comes in contact with many things throughout the day will change fairly quickly so that the dark color stays in the low areas of a design and rubs off of the high spots giving beautiful dimension to a piece. A ring or bracelet, because you are constantly using your hands, will wear much faster than an earring or even a necklace. The platinum-like coloring you see on commercial white gold is due to a rhodium plating covering the white gold. I like to see the warmth of natural white gold and therefore don't like to rhodium plate. Because white gold mixes gold with nickel to get it’s whiter coloring, however, those with nickel allergies may have issues if it is in contact with the skin for long periods of time. For this reason, I try to stay away from using unplated white gold posts or earwire. Unlike standard white gold, palladium white gold is a slightly different alloy with a bit of a color difference but does not use nickel and therefore can be used in the case of nickel sensitivity. The best care for your metal jewelry, honestly, is frequent wear. Tarnishing is most likely to occur when jewelry is stored away; silver, especially, loves to be worn! When worn very often or everyday, silver does not tarnish. That being said, the few times I would recommend removing your jewelry are before hot tubbing or a dip in the pool (silver hates chlorine!) or before moisturizing (it won't hurt it but all that dried lotion can get stuck in the details of your jewelry). If you are going to store your jewelry, put it somewhere it isn't going to get crushed. For silver, placing anti-tarnish strips with your jewelry will help keep it bright. If your silver does tarnish, you can use a Sunshine Cloth or polishing cloth to clean your piece. The cloth will remove the tarnish and polish your piece.